I want to have a murder mystery party. 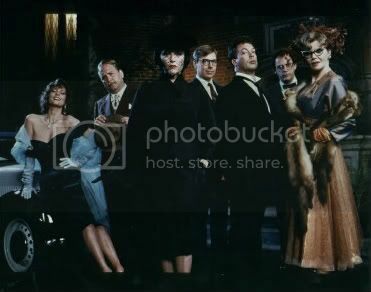 I used to watch Clue on an almost weekly basis, and watching it again this afternoon, I cannot for the life of me remember why I stopped doing it. It's one of my favorite fun movies that I don't really have to pay attention to in order to enjoy it. Kind of like the board game. Movies based on board games should not function, but I guess this one leant itself to screen adaptation from the beginning. Also, there was a nice precedent for silly crime movies set by Murder By Death, so I guess they didn't exactly break the mold with this one. But I love it dearly anyway. On a semi-related note, I need to stop fantasizing about living in the movies I've been watching. It's probably a symptom of the fact that I'd rather be anywhere but here.